I awoke to an overbearing smell of hot sauce. It was that time again. The time I could not invite anyone over to my home, knowing they would simply not understand. I could hear dishes clanging against each other, and the kitchen faucet's steady stream. I got up, walked over to one of the bar stools, and watched as my mother prepared the kimchee. She smiled at me when she noticed I had taken a seat without saying a word. I didn't want to interrupt her concentration while she prepared the common Korean dish, but the smile on her face made me want to help her through this grueling process—adding spices, mixing, lifting heavy pieces of cabbage to the rugged cutting board. This morning, I was awakened by the clinking of chopsticks and my parents-in-law’s conversation over breakfast. If it had been an ordinary day, I would have hit the hay again, but today is Parent’s Day and I had to get up to greet them. I set the alarm at 7 before going to bed last night, because that’s the time my in-laws usually wake up, but they got up pretty early. It was a few minutes past 6 when I heard them in the dining room. Colours, Colours, Colours! A Good Vibes Post for My First Two Weeks Back in Ireland. I’ve been back in Ireland for approximately two weeks. I promise that during this post I will not mention the weather too much. All I can say is that it has been unseasonal. When we return to Ireland we spend most of time in my parents home and my old stomping ground, Beechdale in Dunboyne. 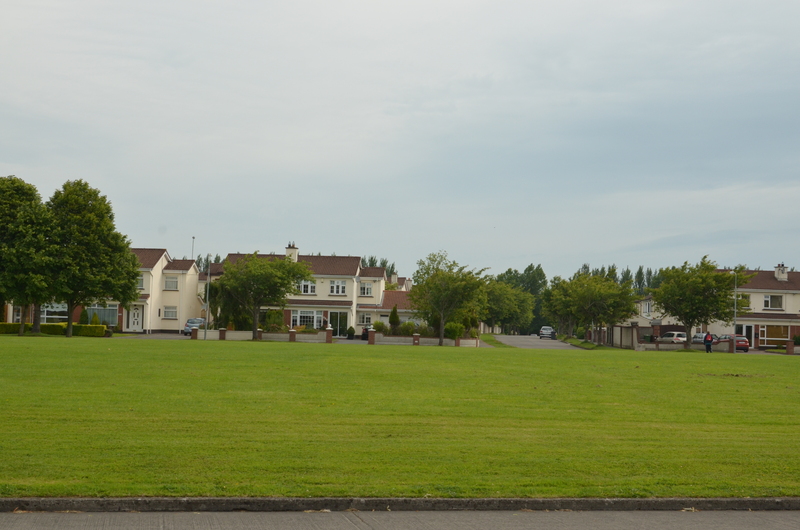 At the best of times it’s a fairly ordinary housing estate on the outskirts of Dublin, albeit in County Meath. We also managed to get down to Kerry for a few days, to show the visitors around (the visitors being Herself’s oul pair who are over here with us). Well, we’ve been doing plenty of touristing around here (yes there are some things worth doing) and also down in Kerry. It has been a good few weeks. Happy Mama’s Day to all the lovely mothers out there in the world! Those of you wanting an actual comic will have to wait until next week. Until then, you can all enjoy my silly gift to my very own mother. If you have yet to wish your mother (or anyone that was like a mother) a joyous day, GET TO IT. It’s not too late for those of you with family on the other side of the world! If you have already done so, feel free to stick around and read this awkwardly long story about the most amazing woman in my life. When I was little, my mother was my world. She was the main reason why I even started drawing. For the majority of my toddler years, this woman was my muse. I still cringe to think about how many times I drew her as a fairy/angel queen that suffered from a terrible case of lopsided head with a side of tiny legs. Today was a very momentous day. We heard your heart beat. 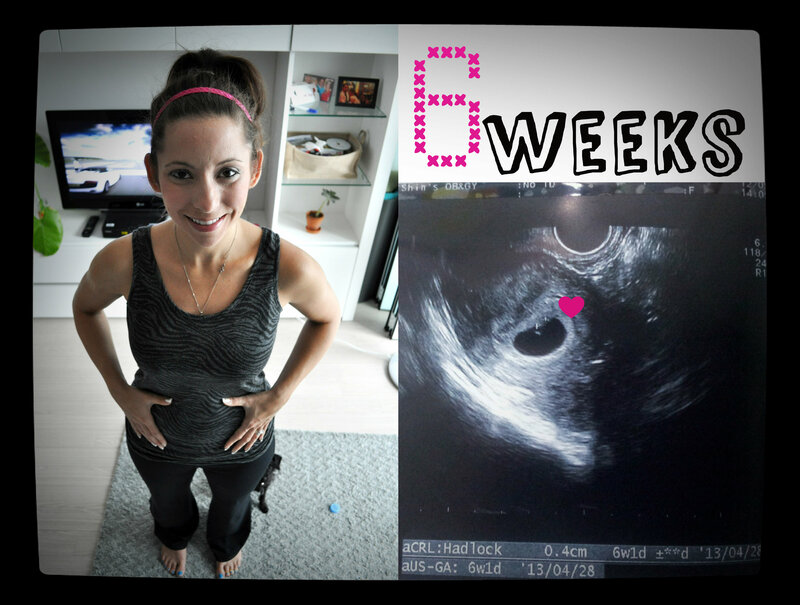 This is the same heartbeat that will be pumping strong for the next century! It was an unbelievable sound. What was equally as amazing was that you were like a beautiful lightening bug blinking with every beat. Your heart at only 6 weeks beats at 119 bpm. Adam and I don’t normally write blogs about our “feelings” especially when we are missing things. We try to focus on the positive when we are away because we don’t want our family back home to read our blogs and then feel sad. We want them to see the good, exciting and amazing things that living as expats brings to our lives. Not a very impressive comic, I know. They will start getting better (eventually…hopefully?). Call me a dweeb, but I think I tend to stress out more than I actually should when I know someone from overseas is visiting. I tend to take on this silent obligation that every single moment they spend here needs to be perfect, and will more than often lead to me using a lot of money and time. What can I say? Do unto others, right? Taken at the 40 Steps Culture and Tourism Theme Street in Jungang-dong, Busan. "The 40 Steps Culture and Tourism Theme Street is where Japanese visitors can feel traces of their ancestors from more than 100 years ago. Veterans and others interested in the Korean War will find the area an important feature of the Korean War." 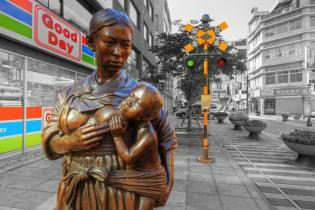 (lifeinkorea.com) Various statues depicting traditional Korean scenes, including this woman breast-feeding her child, can be found throughout the streets near Jungang-dong Station. All the statues in the area were commisioned by the city for this theme and made by a Korean artist (forget the name). The statues have been up for public viewing since 2004. About the shot: A few techniques were used to create this image. First, a tonemap, using 3 different exposures and blended, creates the high detail and contrast; then, the picture was divided into colors and greys, their separation meant to evoke both the modern and the traditional; and, the train lights that were originally red were manipulated to become green and red, in order to outline a tension and release. The "joys and sorrows" of war are manifest even in the most ordinary (my taking the shot), tender (the mother and child) and passing (history, the train tracks) circumstances. Taken October 2009 in Jungang-dong, Busan.